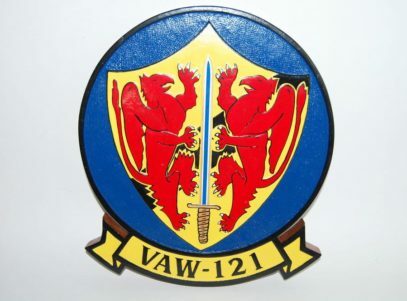 Along with VAW-122, VAW-123 and VAW-120, VAW-121 was created out of the “super squadron” VAW-12 on 1 April 1967. Until then, VAW-12 had deployed 4-plane detachments to accompany carrier air wings. Unlike its siblings, VAW-121 flew the E-1B Tracer, until the mid-1970s. This was due to the fact there were still carriers in the fleet that were not capable of handling for the larger E-2 Hawkeye, principally the USS Franklin D. Roosevelt and the Essex-class carriers. In 1977 VAW-121 made its first deployment as part of Carrier Air Wing Seven (CVW-7) on the newly commissioned USS Dwight D. Eisenhower. In 1980 VAW-121 deployed for 347 days at sea with Dwight D. Eisenhower/CVW-7 setting a modern-day record that would not be broken until the deployment of the USS Theodore Roosevelt during Operation Enduring Freedom. 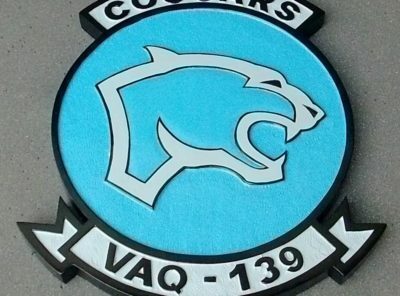 In 1981 the squadron deployed for three months to NAS Keflavik, Iceland, in support of the Icelandic Defense Force. Upon their return, VAW-121 deployed to the North Atlantic for a large NATO exercise in which VAW-121 kept squadron aircraft continuously airborne for 23 days. 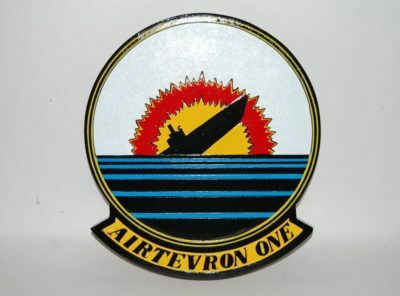 The squadron returned to the Mediterranean Sea in January 1982 and was awarded its third consecutive Battle “E” and AEW Excellence Awards, both firsts for a VAW squadron. During this deployment, the squadron was involved in overseeing the evacuation of Americans from Beirut. Returning from the three-month winter deployment to Iceland, the squadron found themselves again in the North Atlantic conducting three CVBG operations with USS Forrestal and HMS Hermes, the later deploying with the new Sea Harrier. The 1983 Mediterranean deployment included contingency operations near Libya and periods of 95 and 92 consecutive days at sea in support of multi-national peacekeeping forces in the Eastern Mediterranean. March 1990 saw VAW-121 embark on the USS Dwight D. Eisenhower for another Mediterranean deployment. This deployment was highlighted by 15 days of around the clock operations in the Red Sea in support of the initial phase of Operation Desert Shield, when external AEW support was non-existent. Once again, in March 1991, VAW-121 was awarded both the Battle “E” and AEW Excellence Awards for 1990. In September 1991, the squadron sailed east once again on USS Dwight D. Eisenhower becoming the first battle group to return to Operation Desert Storm. Although hostilities had ended, the squadron provided coordination and control for several joint multi-national exercises. The cruise culminated in a two-week NATO exercise, Teamwork ’92, in the fjords of Norway. 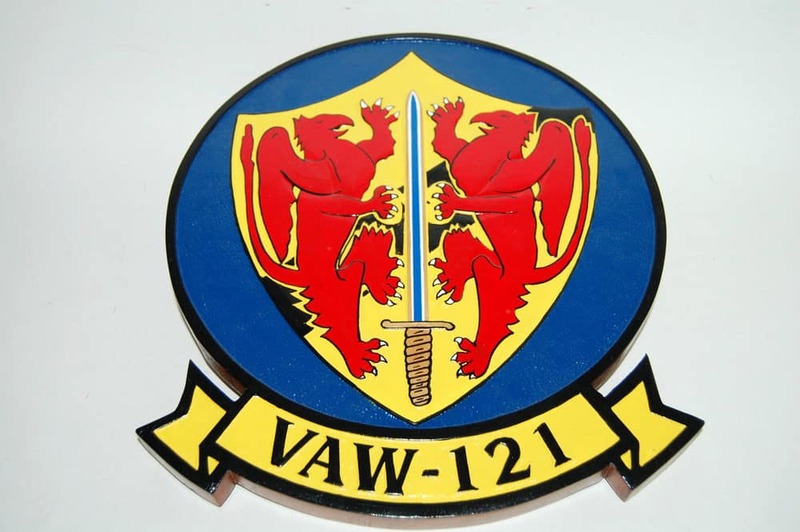 In September 1992, VAW-121 were reassigned to the navy’s newest aircraft carrier, the USS George Washington, and participated in its initial two month “shakedown”. 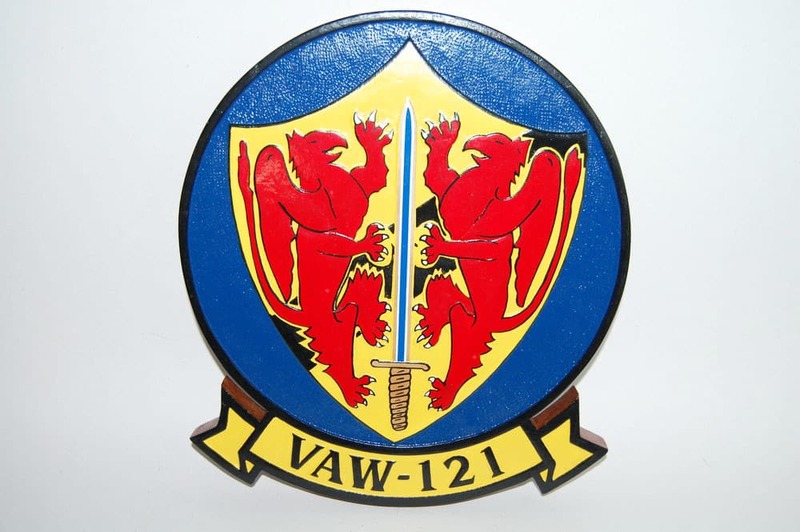 February 1993 found VAW-121 deployed to Howard Air Force Base, Panama. 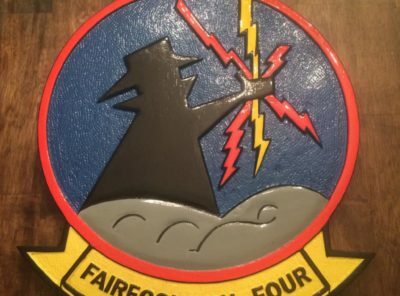 For two months, the squadron, as part of Joint Task Force 4, provided airborne surveillance to help stem the flow of drugs in the Central American region, fusing the efforts of the U.S. Air Force, DEA, and Coast Guard units in the interdiction of numerous narcotics flights. On 20 May 1994, after an extensive work-up period, the squadron, embarked aboard USS George Washington for her maiden deployment. Highlights of the voyage included the commemoration of the 50th anniversary of D-Day off Normandy as well as critical participation in Operation Deny Flight over Bosnia-Herzegovina and Southern Watch over Iraq. VAW-121 departed on deployment bound for the Mediterranean Sea and Arabian sea in January 1996. 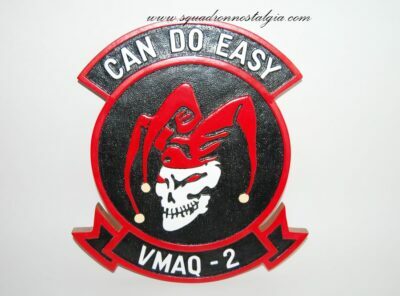 The squadron supported Operation Decisive Endeavor over Bosnia-Herzegovina and Southern Watch over Iraq. The squadron returned home in July 1996 and immediately began their transition to the new E-2C Group II aircraft. In December 1996, the squadron passed the 30 year 59,000 hours mishap free hour mark, the best safety record in carrier aviation. 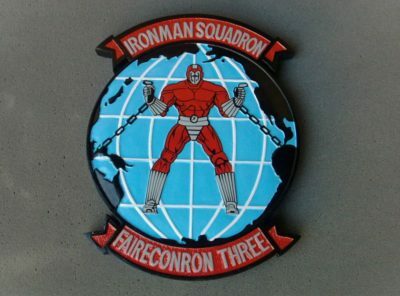 In February 1998 the squadron deployed on board the USS John C. Stennis. During the ship’s around the world deployment, the squadron coordinated multi-service operations with the United States Air Force, United States Army, and United States Marine Corps in support of Joint Task Force-Southwest Asia Operation Southern Watch. In addition, the squadron controlled many multi-national exercises involving air and naval forces of Saudi Arabia, Kuwait, Bahrain, the United Arab Emirates, Oman, France, United Kingdom and Australia. 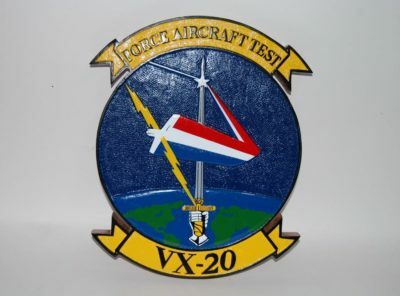 The squadron went on to win three consecutive TOP HOOK awards and became the first E-2C squadron to win the CVW-7 TOP HOOK award for deployment. 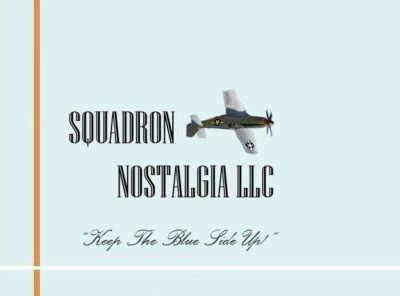 From October through December 1998 the squadron operated from NS Roosevelt Roads in support of Counter Narcotics operations. The squadron earned the “Triple Crown” of AEW Awards- the COMNAVAIRLANT Battle “E”, the CNO Safety “S” and the Fred Akers AEW Excellence Award. The squadron and CVW-7 returned to the USS Dwight D. Eisenhower for their latest set of work-ups and deployment. In December 1999, the squadron passed the 33 year 64,000 hours mishap-free mark, the best safety record in carrier aviation. VAW-121 supported peacekeeping missions over Kosovo and Albania while operating in the Adriatic Sea. USS Eisenhower proceeded to the Persian Gulf to support Operation Southern Watch, while the squadron flew multiple missions over Kuwait in support of strikes on Iraq, providing command and control for the first strikes in the Eisenhower’s 22-year history to actually drop bombs on foreign soil. On returning from a mission on March 31, 2010 an E-2C Hawkeye suffered a catastrophic engine failure. The condition of the starboard engine made the aircraft almost impossible to control. The pilot, Lt. Steven Zilberman, made sure the aircraft stayed level so the other three crew members could bail out safely. Seconds later, the Hawkeye crashed into the sea. After three days of a massive search he was declared lost at sea. For his courage he was posthumously awarded the Distinguished Flying Cross. 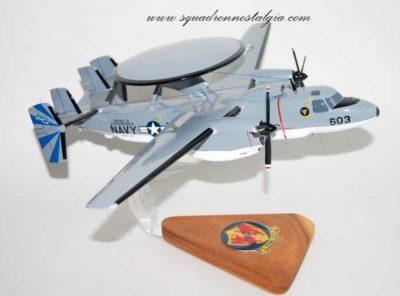 The squadron, began using its first E-2D Advanced Hawkeye aircraft in 2014, ending 37-years operating the E-2C Hawkeye.